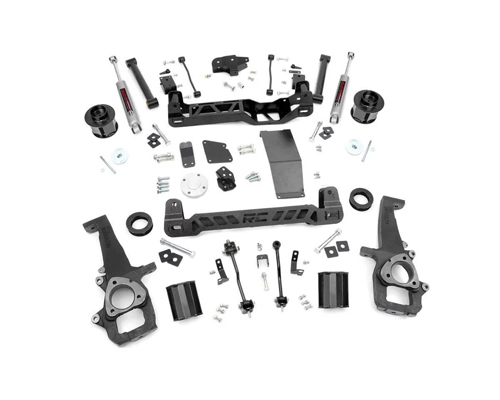 Front: Lifted knuckles, strut spacers (or optional lifted struts), front & rear crossmember, differential drop brackets, driveshaft spacer, sway bar links, skid plate and hardware. Rear: Coil spacers, fixed upper control arms, sway bar links, track bar bracket, bump stop brackets, brake line brackets and hardware. Control arms allow for proper driveshaft angle. Control arms feature Clevite brand OEM style rubber bushings. Factory tuned coil springs maintain stock ride quality. This lift is not recommended for use on the TRX models due to possible CV shaft vibration caused by the additional lift. - Consider our 4" lift system for about 5" of lift or replace the TRX struts with standard struts for use with this system. Kicker braces - Add rigidity to the front crossmember assembly, highly recommended for aggressive off-road use. 0.25" Wheel spacers - Allow ability to run factory 20" wheels with 35x12.50 tires. May require light grinding of knuckle to provide adequate clearance.